Victoria. 1837-1901. 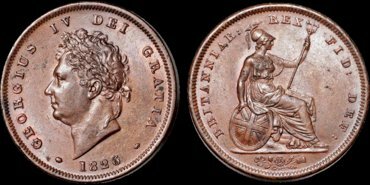 Bronze halfpenny. 5.83 gm. 25.5 mm. 1861, "HALP" variety. 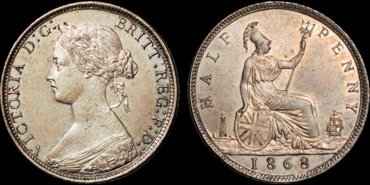 Her young draped bust left; VICTORIA D: G: — BRITT: REG: F: D: around; obv 3 / Britannia seated right; HALP — PENNY around; 1861 in exergue. S. 3956. Peck unlisted. Freeman unlisted. Evenly toned Very Fine, a "no problems" example of an extremely rare and pronounced mint error. Victoria. 1837-1901. 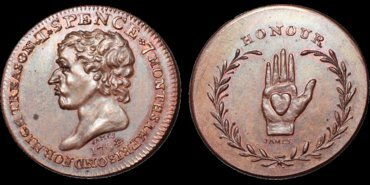 Copper-nickel proof halfpenny. 5.65 gm. 25.5 mm. 1868. 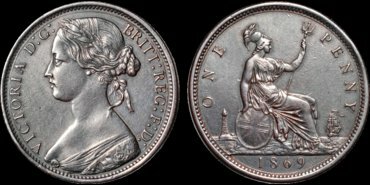 Her young draped bust left; VICTORIA D: G: — BRITT: REG: F: D: around; obv 6 / Britannia seated right; HALF — PENNY around; 1866 in exergue; rev G. S. 3956. 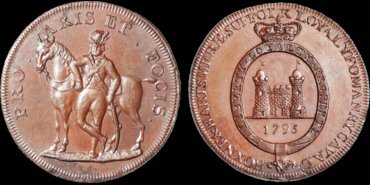 Peck 1794 (R). Uncirculated; a particularly attractive piece with much iridescence and light toning in the fields; this piece is attractive and almost entirely "problem" free; most of the few sold in the past decade had some notable surface problem—"flecking," "brush marks," "minimal handling", atypical toning, mottling…. 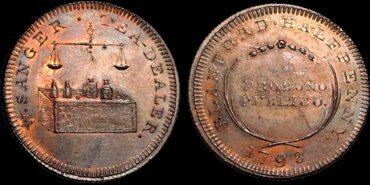 A trial striking, using the current dies for the English 1868 halfpenny, by the Mint to test the alloy they used to strike the Jamaica currency penny and halfpenny of 1769; a more detailed discussion of the overall characteristics can be found on page 425 of the Peck (BMC) reference. George III. 1760-1820. Copper penny. 18.75 gm. 34 mm. (⇈) Late Soho. 1807. Laureate and draped bust of George III right; GEORGIUS III • D . G • REX. around, 1807 below / Britannia seated left; BRITANNIA around. Edge: Grained in a deep groove. S. 3780 type. Peck 1344. Good Extremely Fine; rich brown tone; fresh underlying surfaces; a pleasing "no problems" early copper. George IV. 1820-1830. Copper penny. 19.62 gm. 33.5 mm. Second Issue. 1826. 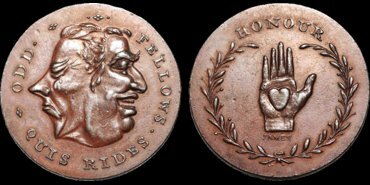 His laureate head left; GEORGIUS IV DEI GRATIA around; 1826 below; / Britannia seated right; BRITANNIAR: REX FID: DEF: around; intertwined rose, thistle and shamrock in exergue; rev A. Plain edge. S. 3823. Peck 1422. Good Extremely Fine+; lightly toned; fresh underlying surfaces. SCOTLAND. John Baliol. 1292-1296. 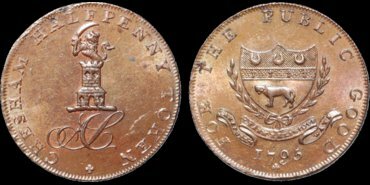 AR halfpenny. .6 gm. 14 mm. Second issue. 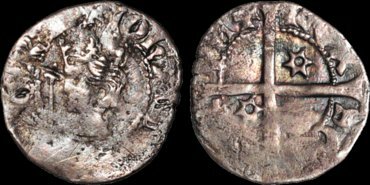 Crowned bust left with scepter in front / Long cross, mullets in two quarters; REX SCO TOR VM+ around. S. 5074. Good Fine; attractively toned; typical uneven strike; marks on obverse. SCOTLAND. James I. 1603-1625. AR 30 shillings. 14.88 gm. 34 mm. After Accession to the English throne. Thistle i.m. The king on horseback wearing the Scottish crown; IACOBVS D G MAG BRIT FRAN & HIB REX / Shield with Scottish arms in 1st and 4th quarters; QVÆ DEVS CONIVNXIT NEMO SEPARET. S. 5503. Very Fine; bold strike on a generous flan; some double striking on obverse legend; otherwise details very clear with choice old cabinet toning. Dramatic and appealing. Ex. S. Hallock DuPont Collection. Ex CNA (now CNG) V. Dec. 1988. IRELAND. James I. 1603-1625. AR shilling. 4.21 gm. 26 mm. 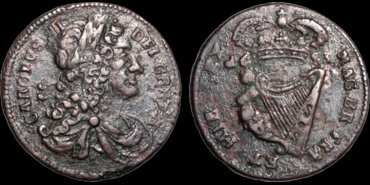 First coinage (1603-4) Bell i.m. His first bust right; •IACOBVS • D G • ANG• SCO • FRA: ET• HIB • REX • around / Crowned harp; •EXVRGAT DEVS DISSIPENTUR INIMICI around. S. 6512. D&F 259. Good Very Fine; sharp portrait and harp; legends partly uneven; attractive toning, good metal. IRELAND. 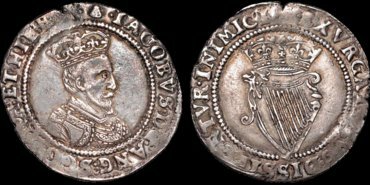 Charles II. 1645-1685. Æ halfpenny. 8.21 gm. 26 mm. 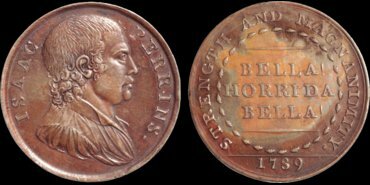 Armstrong & Legg's Regal Coinage. 1683. His bust right / Harp. S. 6575. Good Very Fine; bold portrait; attractive green and red patina. Warwickshire 13. Perrins. Æ penny. 18.35 gm. 34 mm. Bust left; ISAAC PERRINS• around / BELLA! HORRIDA BELLA! in three lines; STRENGTH AND MAGNAMINITY around; 1789 below. Extremely Fine; glossy surfaces; reverse toning lighter in center. Buckinghamshire 20. Chesham. Æ halfpenny. 9.27 gm. 28 mm. 1795. 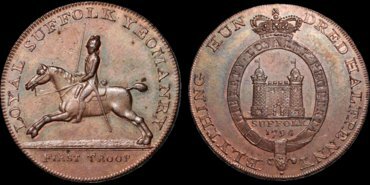 AS monogram; a lion with a sword standing on a tower; CHESHAM HALFPENNY TOKEN / Arms; FOR THE PUBLIC GOOD 1795. Edge: PAYABLE AT ADAM SIMPSONS. Extremely Fine; lightly toned over fresh surfaces; traces of original mint red evident; struck on a slightly flawed flan. Cheshire 5. Chester. Æ halfpenny. 9.02 gm. 29 mm. Three castles; N E S W (cardinal directions) in field around; HALFPENNY PAYABLE AT PROMISSORY around / R & Co cypher, owl above; CHESTER. Edge engrailed. Prooflike Uncirculated; blue highlights in the mirror luster; choice. The Dr. Harry Salyards Collection. Ex Tom Rinaldo, EAC 1996. Dorsetshire 1 (R). Blandford. Æ halfpenny. 9.53 gm. 28 mm. A counter with canisters, a scale above; W. SANGER TEA DEALER / PRO BONO PUBLICO in center; BLANFORD HALFPENNY 1798 around. Edge: milled. Mint State; red and brown; choice. Middlesex 337 (R). Hornsey. Æ halfpenny. 8.86 gm. 29 mm. View of a church behind trees; HORNSEY . 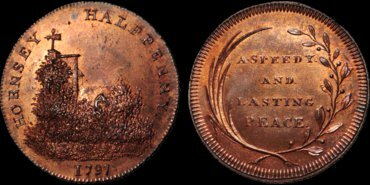 HALFPENNY 1797 / A SPEEDY | AND | LASTING | PEACE between palm branches and laurel. Edge: engrailed. Mint State; full red and choice. Middlesex 383 (Scarce). Maymott's. Æ halfpenny. 9.18 gm. 30 mm. Britannia seated holding scales and a spear; MEYMOTT + & + SON + LONDON. 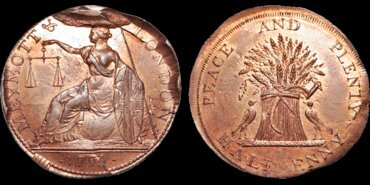 + 1795 + in exergue / A wheatsheaf, doves beside; PEACE AND PLENTY HALFPENNY around. Mint State; red and brown. Struck with a fractured obverse die. Choice and dramatic. 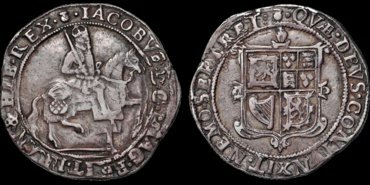 Middlesex 459 (Scarce). Prattent's. Æ halfpenny. 29 mm. 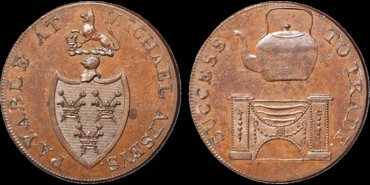 An anchor and a shield, a radiated cap of Liberty above, sprigs of laurel beside; LONDON COMMERCIAL TOKEN 1796 around / The arms of London. Uncirculated; even brown tone; choice coin (NGC MS 65). Photographed through plastic (some light scratches in plastic, not in token). Ex Robinson Brown (DNW, October 1, 2010). Middlesex 467. 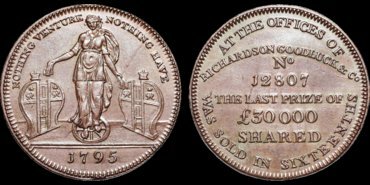 (Rare and unlisted variation) Richardson's. Æ halfpenny. 11.06 gm. 31 mm. Struck with a medal turn (↑↑) rather than the usual coin turn (↑↓). 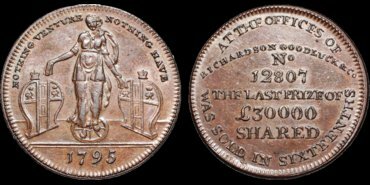 Fortune standing between two lottery wheels; NOTHING VENTURE NOTHING HAVE around; 1795 below / AT THE OFFICES OF | RICHARDSON GOODLUCK & Co | No | 12807 | THE LAST PRIZE OF | £30000 | SHARED | WAS SOLD IN SIXTEENTHS (larger lettering variety). Brown and Red Uncirculated; attractive; the die breaks very faint. 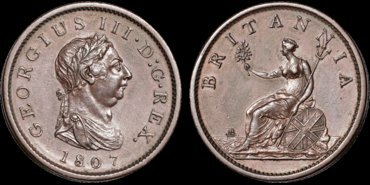 The reverse legend celebrates a prize of £30,000 (£2,420,000 in today's terms) divided into 16ths (£151,250 each at a time when £100 per year would be a generous living). Samuel (Bazaar, Exchange and Mart, Sept. 1882) notes that lotteries in England began in the reign of Elizabeth I. They became a source of income for the government who contracted with firms like this one. Richardsons found "in the provinces an elderly female by the name of Goodluck whom they nominally took into partnership for …the effect her name would have upon the public mind." Samuel goes on to explain that the ploy worked very well for the firm. A related piece, Middlesex 471 shows a “Bluecoat Boy," a scholar from Christ’s Hospital, in front of a lottery wheel preparing to draw a winner; a cornucopia spilling money is below the exergue line along with the 1795 date. This is the other main design. Middlesex 467 through 471 lists Richardson pieces but there are two major varieties--the female and the Bluecoat Boy. Middlesex 467. Richardson's. Æ halfpenny. 10.98 gm. 31 mm. (↑↓). 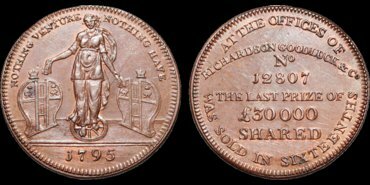 Fortune standing between two lottery wheels; NOTHING VENTURE NOTHING HAVE around; 1795 below / AT THE OFFICES OF | RICHARDSON GOODLUCK & Co | No | 12807 | THE LAST PRIZE OF | £30000 | SHARED | WAS SOLD IN SIXTEENTHS (larger lettering variety). Brown and Red Uncirculated; attractive; the die break on the obverse very faint; more pronounced reverse die break. Middlesex 468. Richardson's. Æ halfpenny. 10.78 gm. 31 mm. 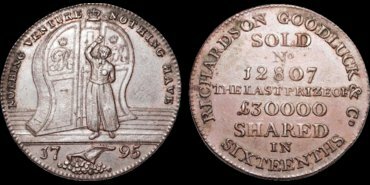 Fortune standing between two lottery wheels; NOTHING VENTURE NOTHING HAVE around; 1795 below / AT THE OFFICES OF | RICHARDSON GOODLUCK & Co | No | 12807 | THE LAST PRIZE OF | £30000 | SHARED | WAS SOLD IN SIXTEENTHS (smaller lettering variety). Uncirculated; attractive light reddish brown tone; the die break on the obverse more pronounced. Middlesex 471 (R). Richardson's. Æ halfpenny. 11.07 gm. 31 mm. 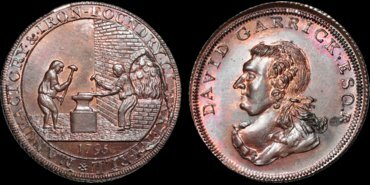 A bluecoat boy standing in front of two lottery wheels; NOTHING VENTURE NOTHING HAVE around; 1795 below / AT THE OFFICES OF | RICHARDSON GOODLUCK & Co | No | 12807 | THE LAST PRIZE OF | £30000 | SHARED | WAS SOLD IN SIXTEENTHS (1 just over L on reverse). Good Extremely Fine; attractive; even chocolate brown tone. This piece, Middlesex 471 shows a “Bluecoat Boy," a scholar from Christ’s Hospital, in front of a lottery wheel preparing to draw a winner; a cornucopia spilling money is below the exergue line along with the 1795 date. Middlesex 467 through 471 lists Richardson pieces but there are two major varieties--the female and the Bluecoat Boy. The Dr. Harry Salyards Collection. Ex Shalowitz 1980. Ex Bobbe, 1996 ANA, Denver. Middlesex 682c. Spence. Æ halfpenny. 10.01 gm. 29 mm. Bust of Spence left; T * SPENCE * 7 MONTHS IMPRISON'D FOR HIGH TREASON * 1794 (4 reversed); JAMES (artist's name) in small print below bust / An open hand holding a heart, laurel branches beside; HONOUR above; JAMES (artist's name) in small letters below. Edge plain. Good Extremely Fine; luster in the legends. Early Baldwin tag with "250" notation in pencil on the price line. Middlesex 804c. Spence. (ND). Halfpenny. 10.83 gm. 28 mm. Thick flan. Odd fellows; ODD FELLOWS QUIS RIDES around / An open hand holding a heart, laurel branches beside; HONOUR above; JAMES (artist's name) in small letters below. Edge plain. Uncirculated; even reddish-brown with a pleasing glossy appearance. Middlesex 1040. Stanhope. 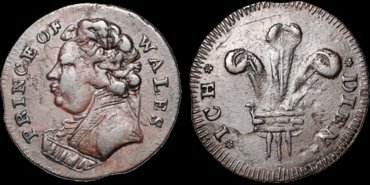 Æ halfpenny (broadstruck). 10.17 gm. 32 mm. Bust left; STANHOPE NOBLE WITHOUT NOBILITY / Hampden's tomb with a HAMPDEN & SIDNEY in an oval frome on the front; a radiated cap of liberty above. SACRED TO LIBERTY around. Edge milled. Uncirculated; choice and a dramatic broadstruck flan; rare thus. John Hampden (1594-1693) and Algernon Sidney (1622-1683) were stong proponents of freedom later cited by American colonial patriots. An American college in Virginia is named after them. Lord Stanhope (Charles) was a supporter of Tooke, Hardy and others protesting for free speech during the reign of George III. Middlesex 1140a. National Series. Æ farthing. 1.72 gm. 20 mm. Bust left; PRINCE OF WALES / Prince of Wales plumes; ICH DIEN. Plain edge. Good Very Fine; dark red; struck on a thin flan with flaws, almost certainly a late use of the 1140 die. Somersetshire 115. Bath. 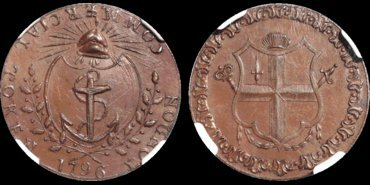 Æ farthing token. 4.67 gm. 23 mm. 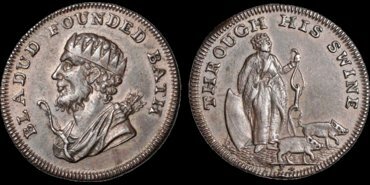 Crowned bust left with a bow and a quiver; BLADUD FOUNDED BATH around / Bladud driving his pigs; THROUGH HIS SWINE around; 1794 below. Good Extremely Fine; toned with hints of original color showing. Suffolk 2 (Scarce). Bungay. 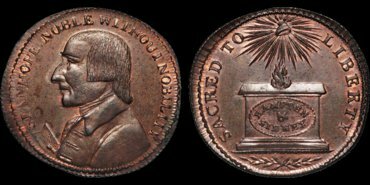 Æ penny (double-thick halfpenny size flan). 21.22 gm. 29 mm. (1794). Remains of an ancient fortress; BUNGAY HALFPENNY around, BIGODS CASTLE in exergue / Justice standing on a pedestal; FOR THE USE OF TRADE around. 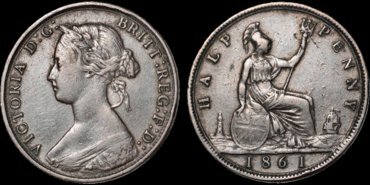 Edge: DOUBLE TOKEN PAYABLE BY S. PRENTICE . X . X . X. Uncirculated; choice example; lightly toned over original surfaces. Though not noted thus by D&H, this double thick flan type is very scarce, particularly so choice. Suffolk 6a. Hoxne. 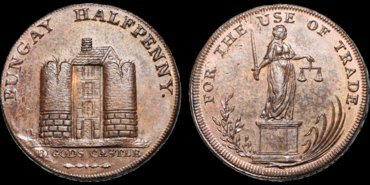 Æ penny (double-thick halfpenny size flan). 20.12 gm. 31 mm. 1795. A dismounted yoeman leaning against his horse; PRO ARIS ET FOCIS. 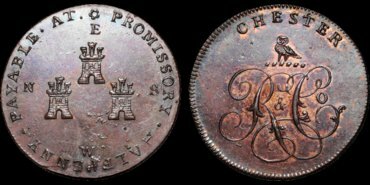 ("For home and hearth") / A castle within a crowned garter with the legend LIBERTY LOYALTY PROPERTY, 1795 below; HOXNE & HARTSMERE SUFFOLK LOYAL YEOMANRY CAVALY around. Plain edge. Uncirculated; prooflike; even reddish brown. Choice example. Though not noted thus by D&H, this double thick flan type is very scarce, particularly in such choice condition. Suffolk 28c. Bury. Æ halfpenny. 10.64 gm. 29 mm. Shield of arms of Bury St. Edmunds; PAYABLE AT MICHAEL APSEYS / A tea kettle and Bath stove; SUCCESS TO TRADE. Edge: plain rounded. Good Extremely Fine; lightly toned over original surfaces.